Belinda Davis's move to Boston had introduced her to a life she never could have imagined growing up in the West. But even the opportunities of wealth, literature and travel left her feeling empty. Realizing her faith had been pushed into the background, she once again invites God to have first place in her life. But now she faces new life decisions that seem even more difficult than before. Torn between two contrasting ways of life, one full of fascinating opportunities in the East and one represented by the beloved farm home in which she was raised, she clings to the principles that are her parents' legacy: faith, love, and family. - Publisher Book 8 of the bestselling Love Comes Softly series. Leaving her little prairie town, Belinda Davis never dreamed that the excitement of living in Boston would leave her restless and empty inside. Wealth, literature, travel, and romance touched her life with choices and decisions that brought dissatisfaction rather than joy. She discovered that only when God had first place in her life was her peace restored. Belinda once again faces decisions about her life that are no less difficult than before. A very unexpected responsibility makes the choice even harder. 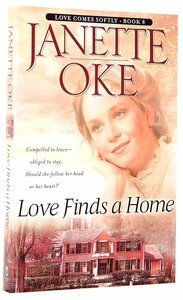 About "Love Finds a Home (#08 in Love Comes Softly Series)"
The first eight books of Janette Oke's landmark series of inspirational fiction, now in just two volumes! These compelling prairie romances follow the pioneering Davis family on their journey of faith. Tragedy and triumph are never far off in these heartwarming tales that have won fans worldwide! It's 19th century America, and newly wed 19-year-old Marty Claridge heads West with her husband in search of land and hope for the future. But when their dream turns to sudden tragedy, Marty's courage and faith are tested to the utmost.